GreenGrid has been designed to offer you the easiest installation of any green roof system (hybrid or otherwise) in the market today. Our design team includes world class roofing professionals to specifically look at GreenGrid design from the installer’s perspective. 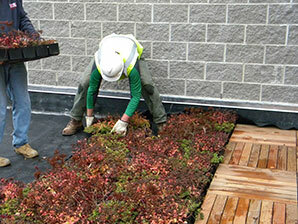 Beyond proper design of your green roof, a quick, trouble-free, and correctly done installation is arguably one of the most important considerations for your green roof project and long-term performance of the underlying waterproofing. A detailed GreenGrid installation protocol has been developed based on over a decade of experience with installations in all U.S. climates and on all types of waterproofing systems. This experience has been consolidated into the Installation manual contained herein [link]. 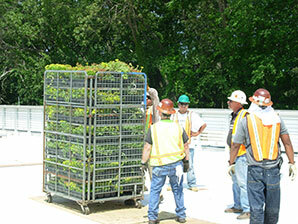 The purpose of this manual is to ensure that the GreenGrid® Green Roof System is handled and installed correctly in accordance to Weston Solution’s (WESTON) (manufacturer) quality standards. This manual is a guideline representing best practices but recognizes that each roof and design will be slightly different and requires the judgment and skill of your professional roofer. 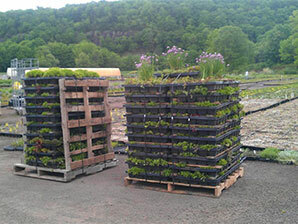 GreenGrid makes installation quick and easy through its innovative, contractor friendly design. 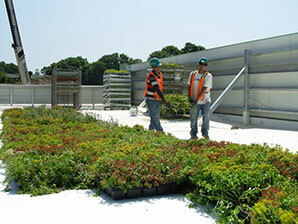 From an installation perspective your green roof should be installed to the highest standard to ensure proper performance and long term functioning roof. To this end, GreenGrid has put together detailed installation protocol for the contractor.